U.S. petroleum production increased by 745,000 barrels per day (b/d) in 2017, driven by a 21% increase in oil prices to approximately $65 per barrel. In the United States, crude oil and lease condensate accounted for 60% of total petroleum hydrocarbon production in 2017, and natural gas plant liquids accounted for 24%. 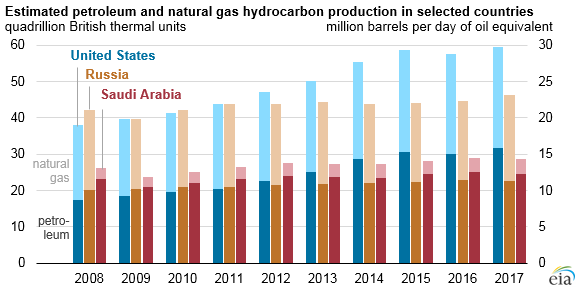 Saudi Arabia and Russia have much smaller volumes of natural gas plant liquids, as well as refinery gain and biofuels production, which combined account for most of the remaining share of U.S. petroleum production. U.S. dry natural gas production grew slowly in early 2017 because of unfavorable economic conditions at that time. Production increased during the last nine months of the year, ultimately leading to a 5.7 billion cubic feet per day (Bcf/d) difference between the first quarter and fourth quarter of 2017. From 2016 to 2017, domestic dry natural gas production increased by 1%, and U.S. liquefied natural gas exports quadrupled. Consumer natural gas demand was mixed, as a result of warmer winter weather compared with 2016 and higher natural gas prices contributing to a 7% decline in natural gas consumption for power generation. Russian and Saudi natural gas production expanded significantly in 2017, at 8% and 6% year-on-year growth, respectively. In contrast, Russian and Saudi total liquids production fell in 2017 compared with 2016. Saudi Arabia and Russia lowered oil production as part of an agreement by the Organization of the Petroleum Exporting Countries (OPEC) and some non-OPEC producers (including Russia) to reduce total crude oil production in an effort to lower global oil inventories. Saudi Arabia’s petroleum production is critical to the Saudi economy, but it is specifically important as a source of domestic energy because the country burned nearly 0.5 million b/d of crude oil for electricity generation in 2017. The continued development of the Wasit, Hasbah, and Arabiyah natural gas fields is expected to reduce the country’s long-term reliance on power generation from crude oil. In EIA’s May Short-Term Energy Outlook (STEO), U.S. petroleum and other liquid fuels production is expected to increase, reaching 17.6 million b/d in 2018 and 19.1 million b/d in 2019, up from 15.6 million b/d in 2017. The May STEO forecasts Russian liquid fuels production to average 11.2 million b/d in 2018 and in 2019, the same as the 2017 production level. The STEO provides a production forecast for members of OPEC as a whole rather than for individual countries. Total liquids production for OPEC, which was 39.3 million b/d in 2017, is forecast to be 39.2 million b/d in 2018 and 39.5 million b/d in 2019. This forecast takes into account recent agreements among OPEC member countries, as well as pledges by some non-OPEC producers, such as Russia, to reduce output. However, noncompliance is expected to increase toward the end of 2018.